And then compilations can also be short, like the thirty minutes of 'Motorway'. It deals with cars passing under bridges and has pure field recordings by The Haters, Claus van Bebber, P.C.R., Kathrin Borsche and Kapotte Muziek. Only the latter gives extra information with his track. The whole thing is rather put together in a very naive manner, and released in an edition of 10 copies. This label was run by Markus Schwill of Exterminator and various other label incarnations. Though nothing says 'Schutt Und Asche' it says so on the Kapotte Muziek discography at the Beequeen website, so we better believe that. He runs a project called Dienstbar as well. 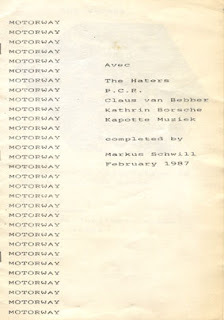 the edition from "Motorway (tape, Schutt Und Asche, 1987)"